Some of the best experiences in a kayak are when you can slip quietly along and observe marine life so close that you feel a part of nature. However, disturbance by approaching too close is often cited as a major threat to birds and other wildlife. Indeed, disturbance of seabird nest sites can cause parents to leave eggs and chicks unattended, making them vulnerable to crows, bald eagles and even the cold from being left unattended. In some cases a seabird colony may desert entirely if it is continually disturbed. So how to best balance wildlife viewing against minimizing disturbance? As a conservation biologist, nature guide and an avid kayaker, I studied the distance that seabirds at nest and roost sites off Vancouver Island exhibited disturbance. This information was used to create guidelines to sustain both seabirds and wildlife viewing. On Vancouver Island, eco-tourism boating excursions regularly visit Cleland Island in Clayoquot Sound and Great Chain Island Ecological Reserve and Mandarte Island near Victoria. Recreational boaters, fishermen and sea kayakers also visit offshore islets, reefs and coastal areas that support roosting and nesting seabirds. 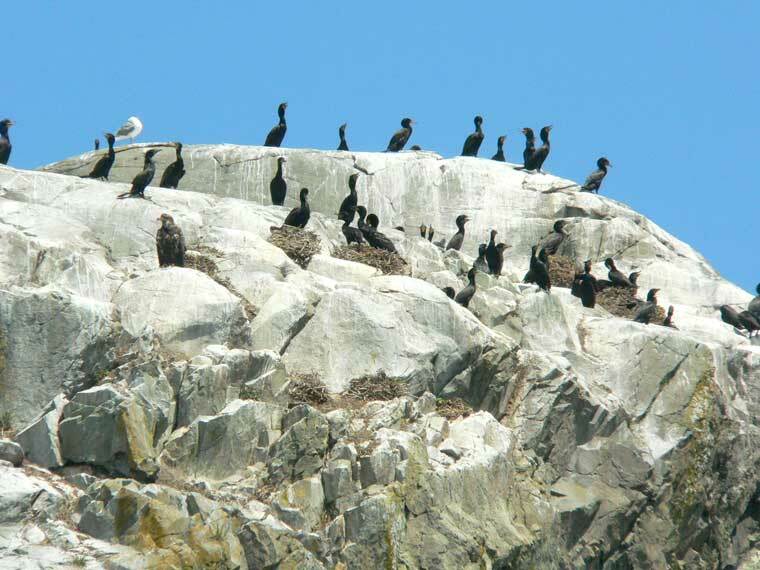 Some of the species nesting on Vancouver Island, including double-crested cormorant, Brandt’s cormorant and common murre, are considered species-at-risk, while pelagic cormorant numbers are declining. Despite consequences of disturbance to nesting seabirds, guidelines for viewing seabirds in British Columbia have mostly been established based on regulations developed for viewing killer whales, or set conservatively to 100 metres with little actual field observation. The goal of my study was therefore to recommend scientifically based set-back distances which would minimize disturbance to birds while allowing boaters to enjoy viewing seabirds. The study included all surface nesting and roosting seabirds in six study areas around Vancouver Island from Barkley and Clayoquot sounds on the west coast of Vancouver Island to Mitlenatch Island, Nanaimo, the southern Gulf Islands and Victoria in the Salish Sea. Park rangers, (including Pete Clarkson, Francis Bruhwiler and Mike Rody) and conservation officers including Peter Pauwels ably skippered the motorboats I used in the study. A single kayak was carried on each motorboat to conduct the tests with both types of craft. The field test involved driving the motorboat slowly (4-6 kmh / 3-4 mph) or paddling the kayak directly towards an islet with a roost or nest site. Species and numbers of birds were recorded and distances were measured with a Rangefinder. I encountered pelagic, Brandt’s and double-crested cormorants, pigeon guillemots, black oystercatchers, glaucous-winged gulls and Harlequin ducks with enough samples to conduct a statistical analysis in the study areas. The distance that the birds showed a visible agitation reaction (considered alertness, neck raising, looking back and forth or standing up more erect to the approach) was recorded. In all I conducted over 500 tests which may seem like a lot, but when it comes to statistical analysis of the multiple factors that could influence the distance at which a seabird is agitated, there always could be more data! With some coaching from my great friend and biometrician, Ruth Joy, I analyzed the probability that birds would be agitated when the boat approached at various distances. I found generally that roosting seabirds were less tolerant to boat approach than nesting seabirds and that different species had different tolerances for boat approach. Black oystercatchers were the exception. They nest on the surface of rocky islets and crouch low down to avoid being noticed. Their nests are very vulnerable to predation if the adult leaves the nest. They are highly distressed by humans landing or walking near their nest and it follows that they are most agitated at close proximity to the nest. Since black oystercatchers are a species of high viewing interest, it is important to know that roosting oystercatchers can tolerate closer approach, while nest sites require protection especially from landing boats and foot traffic. Is there a difference in seabird response to kayaks versus motorboats? My study demonstrated that a single kayak could approach closer than a motorboat to seabird roost and nest sites without an agitation response. With the kayak at 40m there was only a 3 to 10 percent chance of seabirds being agitated. Seabirds likely perceive a group of kayakers as a larger threat than a single kayak and kayakers generally travel in groups. As well, kayakers have been known to disturb birds as they are able to approach and land on islands that motorboats cannot access. These factors, combined with other managers’ recommendation to setting simple, easy to remember guidelines, led me to recommend sharing a general single set-back distance based upon the motorboat agitation response threshold of 50m. My data suggest that site-specific set-backs are needed where two highly sensitive species, Harlequin ducks and Brandt’s cormorants, occur. Although Harlequin ducks are not at-risk in British Columbia they are a species that is considered to be sensitive and likely declining. Research scientist Ian Goudie reported that due to their small body size and high winter feeding requirements, Harlequin ducks cannot accommodate increased stress. During the late spring-early summer time when my study was conducted, male Harlequin ducks congregate in molting aggregations around small islets. As they cannot always fly when their feathers are molting, Harlequin ducks are very sensitive to disturbance at this time. Kayakers should approach seabird roost and nest sites in a tangential manner, and then paddle parallel to shore at the prescribed distance. The tangential approach is less threatening to birds than either a direct approach or a stealthy approach from behind rocks. Harlequin Duck and Brandt’s cormorant roost aggregate sites should receive an extra 20m buffer to the 50m and have a strict no-landing policy. If so, then disturbance to seabirds from kayaks could virtually be eliminated. The set-back guidelines determined by my experimentation turned out to be significantly less than the 100m guidelines recommended at present. The knowledge that guidelines are based on science, rather than just another rule, should help with compliance. This should include establishing codes of conduct in consultation with boat tour operators, park and management agencies, marking of set-backs with buoys and having wardens monitor sites. Education for recreational boaters, park managers and guides to recognize seabirds, the signs of bird agitation and understand the implications of disturbance is a good first step. I believe that given knowledge and guidance, kayakers and other outdoor enthusiasts will become the greatest supporters of seabirds and other conservation efforts. 1. Do not land on seabird nest or roost sites. 2. Slow to less than 5 kmh within 200 metres of a nest site. 3. Approach seabirds at an angle or parallel to the shore. No sneaking up on birds! 4. Stay 50 metres away from seabird nest sites and important roosting islets. Note: In Gulf Islands National Park Reserve there is a 100 metre buffer around islets in the Special Preservation Zone. In the Broken Group Islands Faber Harlequin ducks are extremely sensitive and roosting areas such as Ballingall Islets and Hornby Island should have a 70 metre buffer. 5. Watch for the signs! Agitated seabirds will raise their heads, act alert, walk about or raise wings before flying. Flying away creates a significant energy loss for birds and can cause birds to abandon their nest and chicks. Trudy Chatwin is a species at risk biologist with the British Columbia government. She is well known for paddling from her home on Protection Island to Nanaimo with her dog as co-pilot.